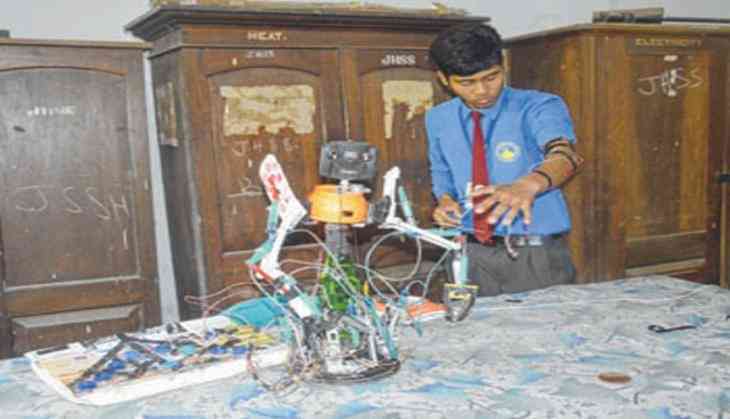 A class XI student has made a robot by using discarded electronic items, syringes and mobile phone parts in Manipur's Bishnupur district. The student of Johnstone Higher Secondary School, Thiyam Nandalal, hailed from a poor family. Speaking to ANI, Nandalal said that the first robot/machine he created was an automatic chicken feeding machine, which dispensed food after a set time without the need for human intervention. The robot has been named as JON 17. The literal meaning of JON 17 is 'JO' for Johnstone and 'N' for Nandalal and 17 signifies 2017. Nandalal said that it took him almost fifteen to twenty days to make the robot. "I can't imagine this project has been materialised. I just prepared the robot with discarded material such as syringe, Horlicks bottle, electronic items, mobile phone parts, LED lamp and others," said Nandalal. He explained that he created the machine to feed the chickens reared at his home so that he could have time to play football as well as study and added that the machine worked on a time limit set using a mobile phone. Nandalal stated that although he has not taken part in any science exhibition, he began to create a robot at home after seeing one on TV, by collecting discarded solar lamps, IV pipes, syringes, remote control cars, plastic bottles, speakers and mobile phones . He initially wanted to show the robot at his school's literary meet but he was not able to finish the robot in time and it was only recently that he brought the robot to school in a suitcase and showed it to his friends. The robot Nandalal created is still in the science laboratory of Johnstone Higher Secondary School . The robot can even grasp a water cup just like a human being based on the action of the wearer . The robot can also function when the controller (wearer) is about 20 feet away. The robot created by the student used the IV pipe as a sort of hydraulic system for movement of its arms . The School Education Director, in a gesture of encouragement, had given Rs 10,000 to Nandalal's teacher for the robot to be finished.